Google Classroom is an under-rated messaging platform for teachers and students. When used effectively, the messaging / commenting capabilities in classroom lead to rich conversations and learning moments between teachers and students. 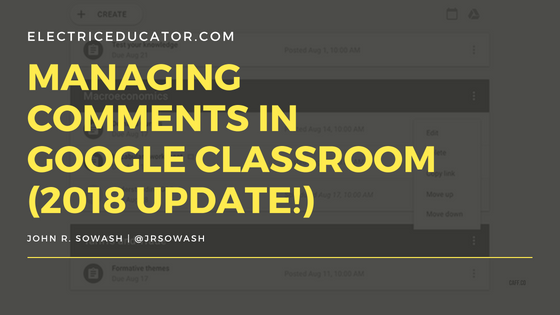 The 2018 update to Google Classroom significantly changed the location and emphasis of three commenting options in Google Classroom. I anticipate a bit of confusion on the part of teachers and students at the beginning of the school year as everyone adjusts to the new layout. 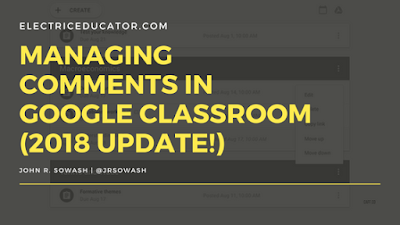 There are three different ways that comments / messages can be sent in Google Classroom: class comments, private comments, and question responses. It is important that both teachers AND students understand when to use each of these three options. 🎥 Note: click here if you prefer learning via video! Class comments are visible to the entire class. 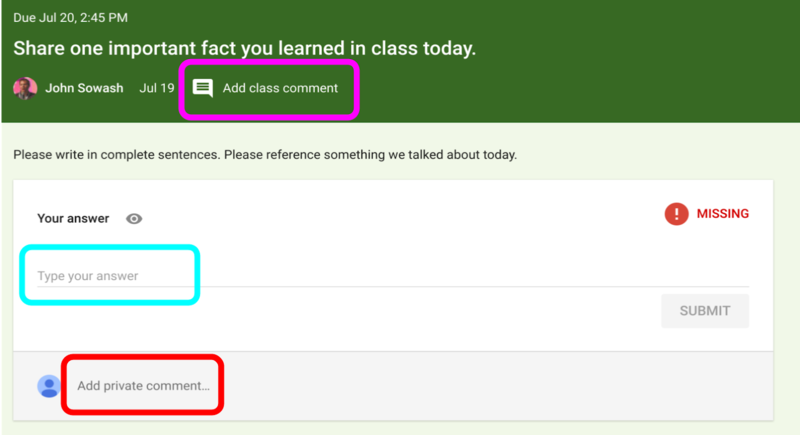 Google Classroom doesn't support student:student messaging, so the class comment feature is the only way that students can communicate directly to one another. Everyone in the class can see class comments. Teachers have the ability to disable this feature entirely, delete an individual comment, and mute an individual student. The class comment area is an ideal place for students to coordinate a study group, ask classmates for help on a challenging problem, or ask for a copy of a handout / resource. Class comments tend to be the most problematic element of Google Classroom. "Hey," "Hi" and "Wasssup" tend to be the most common comment that is left! This is distracting and causes lots of annoying notifications! I recommend that teachers allow students to set the policy for comments. Ask them what type of comments that want to see and how they would like this feature to be used. Once they have established their own ground rules, allow them to self-police their policy. If they are unable to use this feature in a professional, useful manner, it can be turned off entirely. Private comments allow a student to ask a question directly to their teacher. 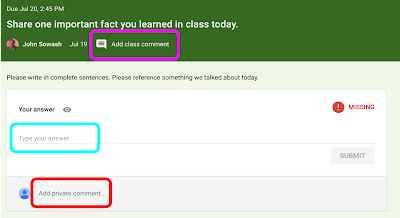 The 2018 update to Google Classroom places a lot more emphasis on private comments. Private comments are a wonderful way for students to ask for help, get clarification on an assignment, and receive personal feedback from their teacher. Teachers will heavily use the private comment feature to provide feedback to students. Check out this video on using private comments to improve essays and other writing assignments. If you use the question tool in Google Classroom to ask a free response question, students have a third way to respond through Google Classroom. The response in this area should be directly related to the discussion question. Submitting an answer will mark this assignment as "done." You have the ability to decide if you want students to be able to view the responses from classmates when you set up the question. You can also prevent students from editing their response. Students won't be able to view responses from classmates until AFTER they have responded. This prevents them from making up an answer based on the class responses. How are you handling comments in your classroom? What policies have been successful? Leave me a comment and share any resources that you have created!